The lone star state isn’t just a place on the map. Her Texas bluebonnets artwork and landscape paintings celebrate the best of this gorgeous country, her determination, her character and faith. Also known as Lupinus texensis or common name Texas Bluebonnet, these beautiful bluebonnet wildflower art pictures and prints are available to purchase framed or unframed. From our Texas Art gallery, bluebonnets are one of Texas signature Texas Symbols, with artworks inspired by the landscapes by Texas artists who regularly for paint the bluebonnet, like Jane Mauldin who specializes in watercolor stills and wildflower landscapes of the Texas Hill Country and Dalhart Windberg, celebrated artist of Texas whose rich landscapes of this varied state grace the walls of homes and offices around the world. We offer this Texas themed artwork that adds flair to your surroundings and show you are proud to be a Texan! 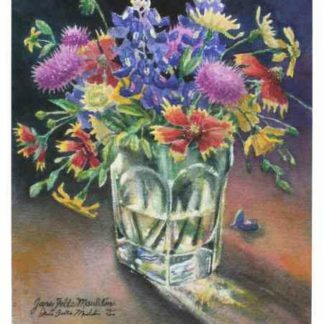 For more details, click on any Texas bluebonnets wildflower wall art pictures below.